Mandala is an ancient art form from the East. Usually Mandalas are a radial symmetrical pattern, repeating elements of design. These are different, using graphic design qualities. 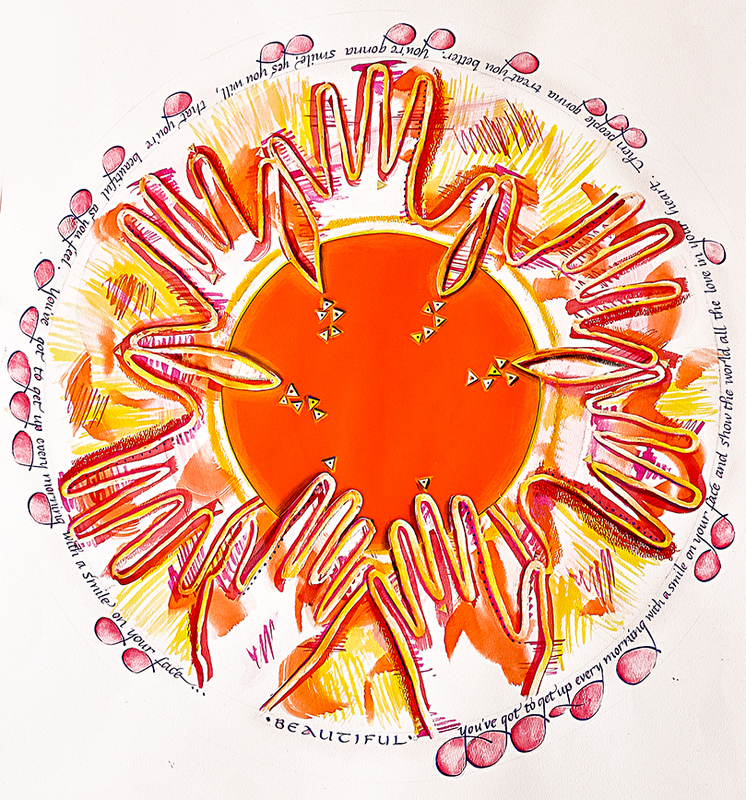 Hands are the focus of Jacqueline Sacs’ MandaLa-La: Knowing hands, globally, are healing energy: The mother cradling her child, the doctor, and the alternative health practitioners who use their Hands-0n healing modalities, Lovers in embrace. Like all valued things from the East, Western culture has adopted and adapted the Mandala. These round formats of art the Jacqueline uses as design elements, contain your hands, your colors, your style, your song (the La-La – Calliagraphy may be added )… it can be a radial design (I AmThe Gift), repeating one pie shaped wedge until the circle is complete, or a free form design (Watercolors). Loving song lyrics, words are part of this modality of visual expression. Every MandaLa-La reflects a unique essence as a Self-portrait. A Family mandala reflects the unity, the core essence of tender embracing that few other art medium captures, including photography. Every member’s hands… that hold, heal, embrace, honor… representing the energy passed along the family chain as we touch one another. Jacqueline’s her-story is this: Most of her artwork contains song lyrics. Since her yearbook editors days at Buffalo State, where she dedicated the book to ‘the song writers’, over time most of her art has included words. It’s no wonder Calligraphy was an early passion. Oil Portraits are Golden Slumbers (Beatles), Bridge Over Troubled Waters (Sail On Silver Girl), Requiem Collection of 31 individual illustrations, with 31 unknown song lyrics, expressing a message… viewable on the Fine Art page. MandaLa-La original artwork is approximately 20″ X 20″ diameter.